Thereâ&#x20AC;&#x2122;s no doubt that your family doctor is well qualified and competent to treat and solve all kinds of health issues, which is why he is your family doctor. 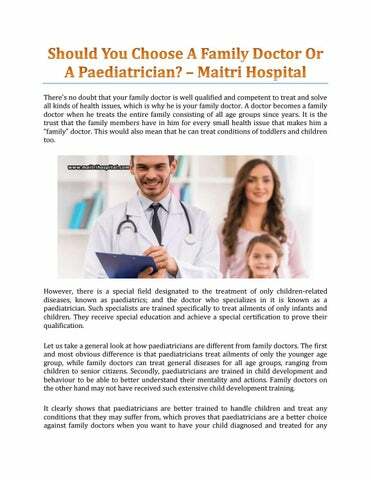 A doctor becomes a family doctor when he treats the entire family consisting of all age groups since years. It is the trust that the family members have in him for every small health issue that makes him a â&#x20AC;&#x153;familyâ&#x20AC;? doctor. This would also mean that he can treat conditions of toddlers and children too.